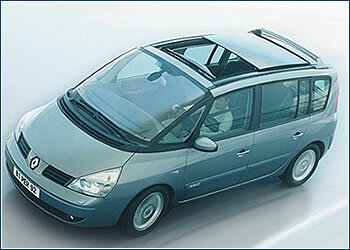 The fourth generation Renault Espace isn’t just a continuation of its successful predecessors. It set its sights much higher in the MPV category with its bold design and its newly conceived variable interior and chassis, which make it handle like a sedan. THE NEW ESPACE follows up on a tradition of nearly twenty years, beginning in the spring of 1984 when Renault launched a spacious car developed and manufactured in cooperation with Matra. The Espace IV and its stretch version, the Grand Espace, are made, along with the Laguna and the Vel Satis models, with which it shares common platform parts, front axle, drive train, and many other elements. The elegant 4.66 meter long Espace concentrates mainly on space, comfort, and a variable interior. It also can boast of the largest glass area in its class, including an unsurpassed large glass roof, the front part of which can be electronically moved. Eight lengthwise rails in the level floor allow a practically endless number of seat adjustments in the second and third rows, all seats being equipped with integrated three-point safety belts . The Authentique version of the Espace comes with a four-cylinder, 2.0-l, 16-valve gasoline engine that puts out 140 hp (100 kW), and sells for CZK 880 000. The same car with a 1.9 dCi, 120 hp (90 kW) costs CZK 940,000. The Expression model, with a 2.0-l, 16-valve, 165 hp/120 kW supercharged turbo engine costs CZK 980,000, and with a 2.2 dCi (150 hp/110 kW) turbo diesel costs CZK 1,040,000. The top of the line are the Privilege models with V6 engines, both selling for CZK 1,275,000. The 3.0-l, V6 dCi, 180 hp/130 kW turbo diesel comes with a five-speed automatic transmission, as does the 3.5-l, V6, 24 valve, 245 hp/177 kW. Grand Espace prices range from CZK 1,020,000 for the Expression model, with a 2.0-l, 16-valve turbo engine, to CZK 1,315,000 for the six-cylinder Privilege model.